ITT Night Vision, the world’s leading producer of Generation 3 image intensification devices, offers the AN/PVS-23 (F5050YG) binocular night vision device for both ground-based and sea-based applications. The AN/PVS-23 (F5050YG) is rugged binocular designed to furnish increased depth perception for activities such as off-road driving and high-speed navigation at sea. 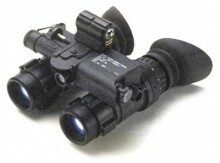 The F5050YG has aviation standard optics. Performance is outstanding because each eye receives a unique image giving greater clarity than can be obtained from single-tube devices. The F5050YG includes a powerful IR illuminator with wide or narrow beam capability. It can be hand-held, head-mounted. When helmet mounted, the F5050YG is powered by a rear-mounted battery pack that contains two pairs of AA batteries for extended operational endurance. Click the button below to add the Morovision AN/PVS-23 (F5050YG) Generation 3 Pinnacle Night Vision Binocular to your wish list.